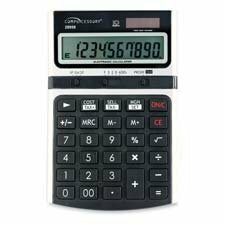 10-digit desktop calculator features an LCD screen and cost/sell/margin function. Other functions include three-key memory; tax function; correct entries function; and 0, 2, 3 and decimal round up/down. Calculator runs on solar and battery (Lithium L-1131) power.